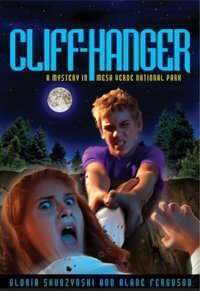 When a cougar attacks a hiker in Mesa Verde National Park, the Landons have another mystery on their hands. 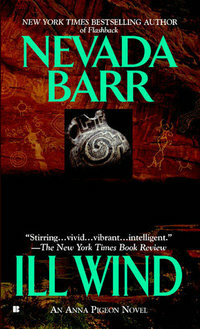 Cliff-Hanger weaves Native American folklore, natural science, and geography into a heart-pounding thriller. This title is one of several in the thrilling Mysteries in Our National Parks series by the award-winning, mother-daughter team, Alane Ferguson and Gloria Skurzynski. The afterword by Will Morris, former Chief of Interpretation and Visitor Services at Mesa Verde, outlines the dangers of cougar attacks and the need to protect wild animals. Two Native-American boys have vanished into thin air, leaving a pool of blood behind them. Lieutenant Joe Leaphorn of the Navajo Tribal Police has no choice but to suspect the very worst, since the blood that stains the parched New Mexican ground once flowed through the veins of one of the missing, a young Zuñi. But his investigation into a terrible crime is being complicated by an important archaeological dig . . . and a steel hypodermic needle. And the unique laws and sacred religious rites of the Zuñi people are throwing impassable roadblocks in Leaphorn's already twisted path, enabling a craven murderer to elude justice or, worse still, to kill again. 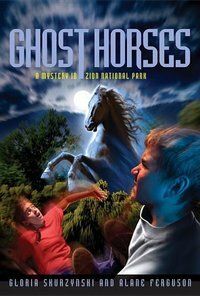 Life-threatening accidents keep plaguing the Landon family as they investigate the mysterious deaths of white mustangs at Zion National Park in Utah. Even before they get to the park, Jack Landon knows that Ethan Ingawanup spells trouble. Things start to go awry after Ethan and his sister--two Shoshone kids--are placed in the Landons' care. The questions begin to mount after Ethan teaches Jack and Ashley the ancient Ghost Dance: Are all the hair-raising events just coincidental? Or is there some strange magic in the dance ritual? The answers await in the raging waters of a slick-rock canyon called The Narrows. The afterword by Lyman Hafen of the Zion Natural History Association discusses white mustangs and public lands in Utah. The Navajo called them the Anasazi: an enigmatic race of southwestern cliff dwellers. For centuries, the sudden disappearance of this proud and noble people has baffled historians. Summoned to a dark desert plateau by a desperate letter form an old friend, renowned investigator Mike Raglan is drawn into a world of mystery, violence, and explosive revaltion. 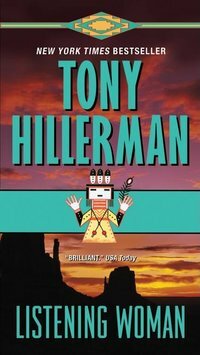 Crossing the border beyond the laws of man and nature, he will learn the astonishing legacy of the Anasazi -- but not without a price. Set in the contemporary Southwest, "The Haunted Mesa" draws on Louis L'Amour's extensive knowledge of Indian lore and mysticism. In this extraordinary book L'Amour tells a tale of epic adventure that takes his readers across the most extraordinary frontier they have ever encountered. The blind shaman called Listening Woman speaks of witches and restless spirits, of supernatural evil unleashed. 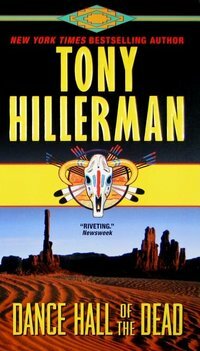 But Lieutenant Joe Leaphorn of the Navajo Tribal Police is sure the monster who savagely slaughtered an old man and a teenage girl was human. The solution to a horrific crime is buried somewhere in a dead man's secrets and in the shocking events of a hundred years past. To ignore the warnings of a venerable seer, however, might be reckless foolishness when Leaphorn's investigation leads him farther away from the comprehensible . . . and closer to the most brutally violent confrontation of his career.